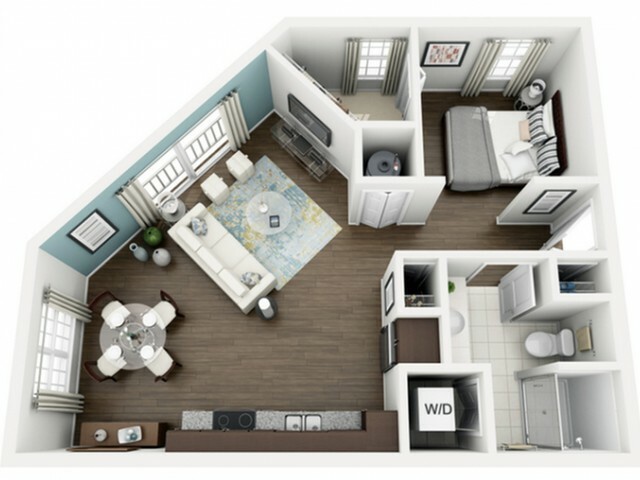 This studio apartment is the definition of big things coming in small packages! Featuring vaulted ceilings that make the already open floor plan feel larger than life! Spacious walk-in closets, storage closets, and plenty of cabinets in the kitchen, we're sure you'll have enough space for everything you have and more! Our apartment homes include espresso cabinetry throughout with granite countertops in the kitchen and marble countertops in the bathroom along with vessel sinks and walk-in showers. This studio home also features wood-style vinyl floors and a stackable washer and dryer.